How to find the best sound insulation solution for your home? What makes a good soundproof curtain? Will a soundproof curtain resolve my noise problem? Can soundproof curtains block traffic noise? Can soundproof curtains block voices? Can soundproof curtains be used to block inside noise? What are the different types of sound? How do soundproof curtains work? Which soundproof curtain to use for a maximum effect? Which soundproof curtain material is best? How can I soundproof my door? How can I attach a soundproof curtain to my door? Why Moondream® soundproof curtains are the best? 1 - What makes a good soundproof curtain? An effective soundproof curtain has to be made with multiple layers of different fabrics, be quite thick and heavy. This means that lightweight sound blocking curtains are acoustically almost ineffective. Once hung your curtain will be more effective if pleated because this will improve the sound absorption. Moondream® soundproof curtains are made with 3 different layers and weigh between 4lbs to 7lbs depending on the length. They have been engineered to muffle the sound coming from the outside to create a more calm and comfortable interior. The performance of our sound absorbing curtains has been tested and certified by independent laboratories. On average they reduce sound by up to 7dB. 2 - Will a soundproof curtain resolve my noise problem? The impact of a soundproof curtain depends on the kind of noise you are experiencing and the construction of your building. If you’re experiencing for example traffic noise, construction or AC noise the sound dampening curtain will help to muffle the sounds but will not block it out completely because no curtain made from fabric is able to do that. To begin with, motorway sounds are notoriously the most difficult to block since they are made up of mostly low-frequency sounds. Secondly, the noise does not come in onlyfrom your windows but also seeps in through the walls and various openings. Once in, the noise creates what's called a "rebound effect" - bouncing multiple times on the wall, the floor, the ceiling. As you can imagine, it is entirely impossible to block sound completly with fabric curtains for your windows alone. Soundproof curtains alone may not be enough, here some tips to improve their results: We suggest you to use double-sided tape to seal the curtain’s edges to the wall. It will help to reduce sound migration around and the amount of sound "rebounding". But keep in mind that, in order to achieve effective sound insulation, your room has to be covered also with absorbent materials, as for example a rug or seal strip self adhesive foam on your windows or doors. 3 - Can soundproof curtains block traffic noise? Our soundproof curtains have been designed to block the outside noise as much as possible with fabric. The results depend a lot on the kind of noise you are experiencing and the results you hope to achieve. To be more explicit: if you are experiencing constant traffic noise, our sound blocking curtains will definitely help to muffle the noise and increase your comfort level but any soundproof curtain made from fabric will never be able to block the sound to 100%. The combination of the different fabric layers in Moondream® soundproof curtains will create a quieter environment for you, but as explained above, the sound is also coming through the wall so reducing its “rebound effect” demands further sound insulating measures. 4 - Can soundproof curtains block voices? Although our noise reducing curtains can't entirely block voices, they can help muffle sounds people make when they speak, sing, laugh, etc. If you live on a noisy street with restaurants and bars, Moondream® soundproof curtains will definitely improve the quality of your sonic environment and provide a significant noise reduction. You'll still hear, say, the rumble of traffic but it will be muffled and softened - definitely easier on the ears. 5 - Can soundproof curtains be used to block inside noise? Once the noise is in your room, happens a “rebound effect.” This means the sound bounces everywhere across the room (from the ceiling to the walls, and the floor). So how do our acoustic curtains work, and how do they absorb sounds to keep them from echoing around the room? Our Moondream® curtains are made with 3 layers (or 4 for our soundproof divider curtain). These layers are heavy and thick, the main quality needed to absorb inside sounds. In a recording studio for instance, on top of the usual soundproofing material, they help to keep a "neutral sound". Moondream® curtains have been tested in independent laboratories, and proven to absorb up to 9dB of internal noise. 6 - What are the different types of sound? There are many different categories of sounds, from natural to man-made. In big cities, we are confronted with man-made sounds, often quite aggressive. We try to find soundproof solutions to create a quieter environment and get rid of: continuous noise (like machinery that runs without interruption), intermittent noise (trains, aircrafts, sirens), impulsive noise (construction equipment) and low frequency noise (traffic). We are exposed to low frequency noise constantly. This is also the hardest type of noise to reduce, let alone block. As such, to cut low frequency noise, the best bet is to mix different solutions: soundproofed windows, noise-reducing curtains, rugs, etc. 7 - How do soundproof curtains work? Sound frequencies get “trapped” in between the multiple fabric layers of the curtain. This prevents sound from going through the curtain. However not all frequencies are blocked by the curtain, so once they make it inside the room, the thick curtain absorbs the echo. The curtain muffles the sound and the atmosphere is quieter. Therefore, even if you hear the noise, it's much less agressive. We have a lot of customer reviews stating that although people still hear some noise, they are no longer disturbed or woken up by it. 8 - Which soundproof curtain to use for a maximum effect? A good soundproof curtain has to be heavy and multilayered. 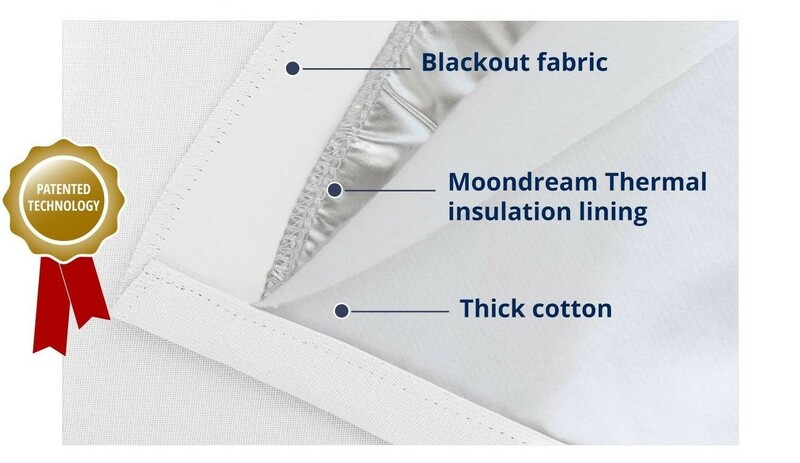 The weight of the Moondream® noise reducing curtains varies from 4.10 lbs to 6.90lbs depending of the length. 9 - Which soundproof curtain material is best? There are various sound insulation materials available, but making a curtain that is not only sound blocking but also functional and decorative is the real challenge. We developed after years of testing the best combination of fabrics which we also hold a patent for (French patent number 12 50968 / European patent number 2623681). 10 - How can I soundproof my door? If you hang a soundproof curtain in front of your door, it will help dampen the noise coming from the corridor and the stairs. 11 - How can I attach a soundproof curtain to my door? You can get something called a “door curtain pole” With this kind of pole you won’t need to open and close your curtain every time you get in or out as the rod is hooked directly to the door. 12 - Why Moondream® soundproof curtains are the best? 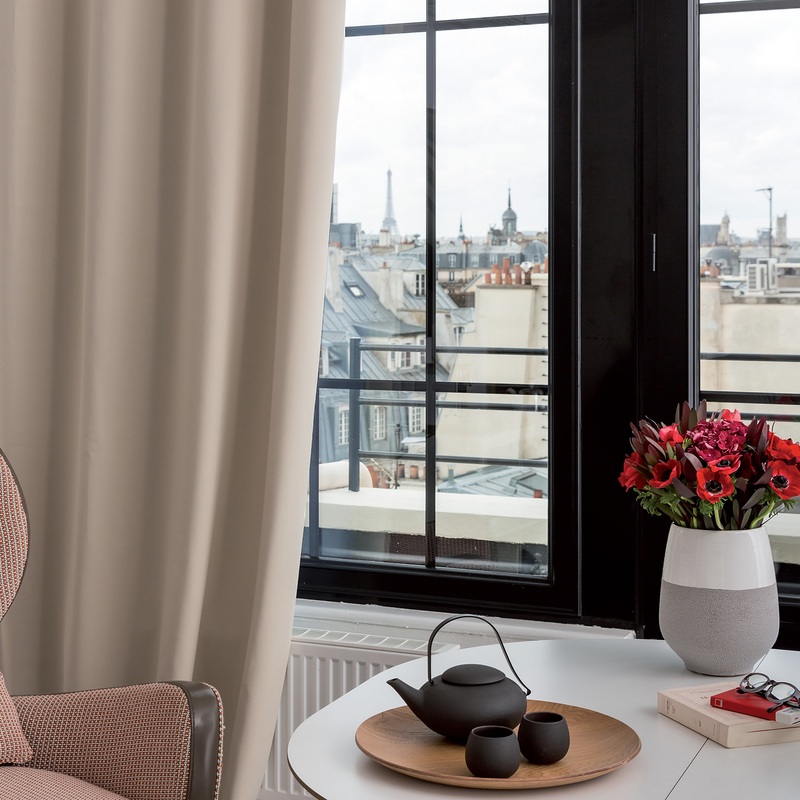 In addition to that, all of our soundproof curtains are multifunctional and provide a blackout and thermal insulation as well - so with just one curtain you can shield your interior from the noise, light, heat and cold!